"I have received many VOB format videos before from my friends, but, I don't know how to fast convert VOB to MP4 on Mac for better playing, sharing or storing." It is true that VOB, namely Video Object, is the container format which contains digital video, digital audio, DVD menus, subtitles and navigation contents multiplexed together into a stream form. You can get it from a VIDEO-TS folder after rip DVD to your hard disk and it can be directly played by VLC, MPlayer, ALLPlayer, etc. Even so, most of portable devices or websites don't support this format so that you can't directly put VOB files to phones for playing and upload to blog or YouTube for online sharing. 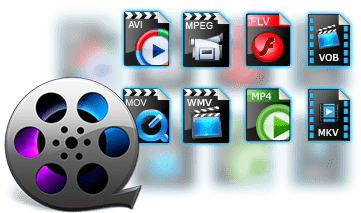 Generally speaking, MP4 video format is one of the most widely used video formats in phones and pads like PSP, iPod, iPhone, etc which are released by Sony, Apple and other mobile device companies. It is a digital multimedia format most commonly used to store video, audio, subtitles and images; it is feature of high compression and taking up the low space under the same image quality. So, MP4 is a great choice for someone who wants to convert VOB file. And, what kind of Mac VOB to MP4 converter should we choose among thousands of Mac video converters? MacX Video Converter Pro is a full-featured VOB to MP4 converting program on Mac and it is designed for converting among various 4K UHD, HD 1080P/720P, SD videos, such as compress and convert VOB to MP4, VOB to WMV, WMV to MPEG, RMVB to 3GP and so on. With the multi-core CPU setting and the high-threading technology, it is capable of finishing the conversion within several minutes. In addition, this VOB to MP4 video converter can also convert VOB directly to iPhone XS/XR/X/8/7/6S/Plus, iPad Pro, iPad mini 4, Apple TV, Galaxy S9, Sony Xperia Z5, Surface Pro 4, etc. Notes: MacX Video Converter Pro is especially designed for Mac users. If you are a Windows user, please head to the Windows VOB to MP4 converter to finish converting. Launch this VOB to MP4 converter Mac, input the VOB file by clicking "Add File". 2Select MP4 as the output format. 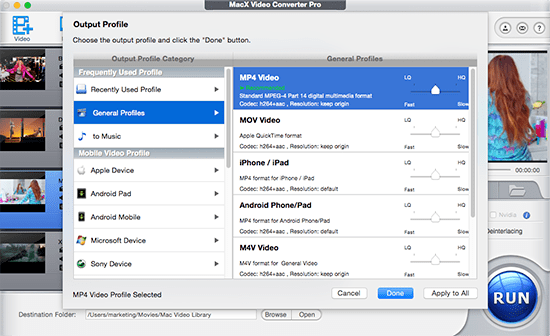 Select the MP4 as the output format from the output profile which is in the "Mac General Video" category. Choose the destination folder for the output video file by clicking "Browse". Start converting VOB to MP4 on Mac by clicking "RUN" button. You will view the conversion process or stopping it at anytime. Warm prompt: The whole conversion process of VOB to MP4 on Mac will be finished very quickly later. Moreover, this best VOB video converter for Mac also has many convenient functions, such as painlessly download YouTube videos, make a tutorial or make photo slideshow on Mac.